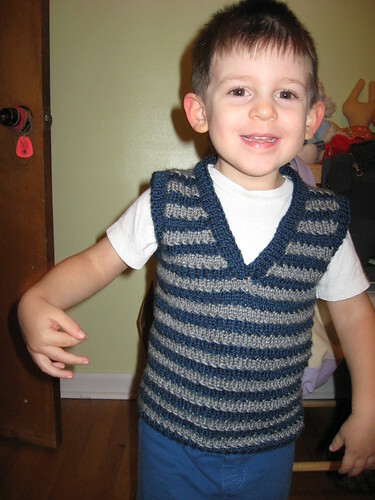 little man in his vest, originally uploaded by Craftydiddl. It’s done! Not done in time for his pictures though. He did wear it to a family party yesterday-so it got shown off to the people who would have gotten pictures anyway. I totally could have had this done by his pictures but i fell very ill again and as much as you guys are probably tired of hearing about me getting sick for the hundredth time i was tired about whing about it-hence my absence and not getting his vest done in time. That’s in the past and i am happy to report that i am currently feeling the best i have felt in about 4 weeks. And more importantly I love how the vest for my little guy turned out. i am so proud of it and it fits perfectly! As i was working on the front i was a little worried that i had not made it big enough but it came out the perfect size. 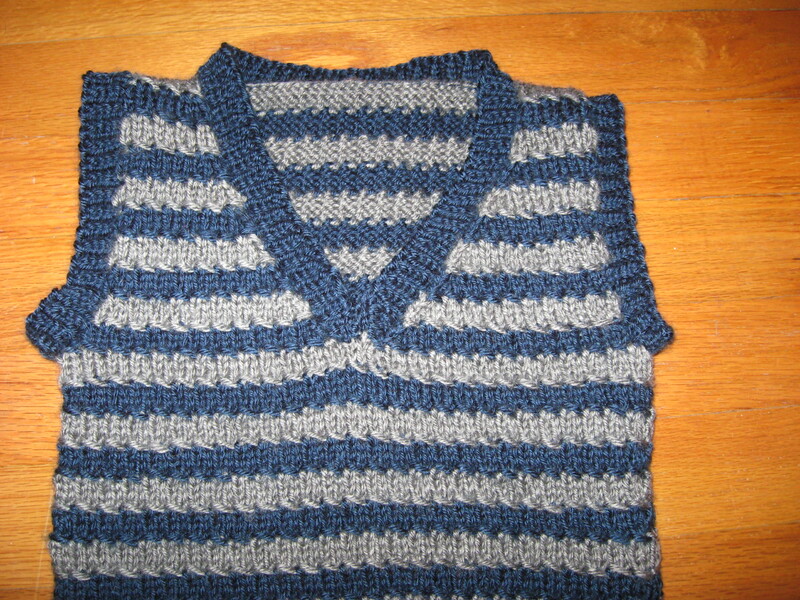 The stitch pattern i used at the start of each new color adds a nice bit of detail so it wasn’t just color stripes. It was a big hit by those that saw it and it makes him look so grown up. I will make another one for him once this one gets too small. But i think it will last until next Fall and i will plan earlier instead of spur of the moment and have it done in time for pictures. Everything is happening so fast. Wow, i just can’t believe it 21 days. i am excited and nervous and just so many things. The last 2 times i flew i got so anxious that i made myself sick-i am one of those people that when nervous or anxious or stressed it goes straight to my stomach-like hundreds of butterflies and i have no appetite. But this year i have been really trying to prepare myself and just think as relaxed as possible becuase i have a little man that has never flown, a hubby that hasn’t flown since he was 7 and it’s an 8.5 hour flight. i have to be the strong one especially once we get there i am the one that knows german and kinda knows her way around the airport-Once we get in the air i will be fine i just hate the ups and downs and i worry about every little thing. Most Importantly i want my little guy to have a nice flight. But i am excited too. My grandpa and his wife(not my grandma just to clarify lol) and an aunt and a close friend of mine will all be meeting hubby and Little Man for the first time!!! Only my grandma comes here to visit that’s why noone else from my german family has met them yet. Well Anyway thanx for letting me babble-it feels good to talk to someone when you have thoughts just boiling over in your head. William’s Hat, originally uploaded by Craftydiddl. HI everybody! This has become more of an FO blog then a daily blog and i apologize for that-i wanted it to be more but honestly i think if i wrote everyday you would be bored out of your mind and wonder what gibberish i am writing about. anyway i am almost finshed witht he second Jaywalker-i am on the foot but since i had a baby shower to go to i wanted to make a quick little something, which is more than i originally planned but i think i needed to get away from my Jaywalker for a couple days. When: I started this last Sunday and finished it yesterday-The longest part was figuring out my W-i wanted it to look a certain way. Pattern: Basically mine but i did use my Itty Bitty Baby hats book just to figure out how many stitches to use for the size i wanted. i cast on 72 stitches (aiming for 6 mth size) Join to knit in the round. I did a 1×1 ribbing for 6 rows and then knit stockinette until hat measured 6 inches. Turn hat inside out and divide stitches in half (36) and do a 3 needle bind-off. Then graph out whatever letter you want or other sign or symbol or picture. 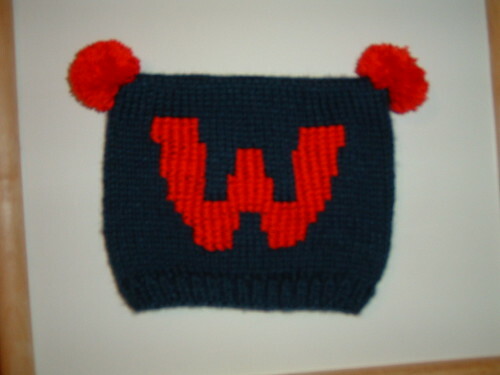 I did a W across 23 stitches and up 22 rows. The W is cross-stitched on the knitting-i wanted to do that technique where it looks like its knitted but i couln’t do it so i did the cross-stitching and i really like how it came out. Then i made 2 little pom poms and added those in heach corner! i love it! i think i want to make one for my little man in big for next fall. Needles & Gauge: I used a 16 inch size 7 circular needle and got 5 sts/in and 7 r/in. if there are any q’s don’t hesitate to ask. Have a great weekend and hopefully my next FO will come sooner.